The Arkell’s Christmas Market is tomorrow! 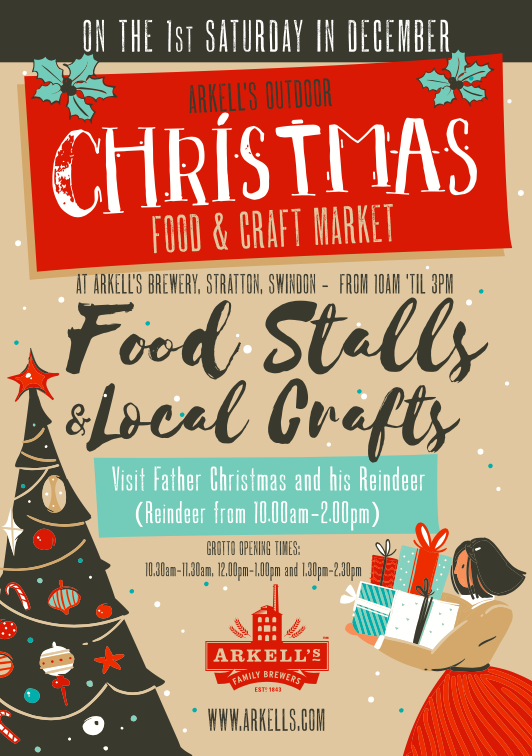 The Arkell’s Christmas Market is back and will be pulling out all the stops to deliver a festive-filled, yuletide market at its brewery in Kingsdown, Wiltshire tomorrow December 1st, from 10:00AM – 3:00PM. Now in its fourth year, the market is already a key part of the festive calendar with thousands flocking to last year’s big event. For 2018, the team at Arkell’s are making the event even bigger to accommodate more craft, food, drink and gift stalls. Visitors can enjoy the taste of fragrant mulled wines and Arkell’s own specially brewed seasonal Sir Noel Ale. A hint of Bavaria is coming to the Christmas Market this year with vendors serving Bratwurst and waffles alongside other festive favourites like hot roasted chestnuts and delicious, hand warming hot chocolates. And it’s not just delicious food and drink people can look forward to. The Bavarian Oompah band, will undoubtedly get you into the Christmas spirit whilst you stroll around the beautiful and historic grounds of the Victorian brewery looking at stalls selling crafts including handmade jewellery, candles, children’s clothing and home crafts all perfect for Christmas presents! Children will get the chance to meet Father Christmas and his reindeer and find out if they’ve been naughty or nice this year! Children can look forward to meeting him between the times of 10:30AM – 11:30PM, 12:00PM – 1:00PM and 1:30PM – 2:30PM. Father Christmas’ reindeer will be at the market 10:00AM – 2:00PM. 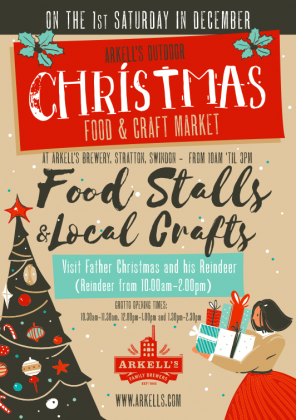 The Arkell’s Christmas market is now a regular date in the town’s festive calendar and the brewery are looking forward to seeing you this Saturday 1st December from 10am. The event is free! Simply come along to the brewery.